We’re cutting straight across the Baja from west to east, from the Pacific coast to the Sea of Cortez. This road is mountainous and steamy hot riddled with constant curves and changing vegetation. At times we see just small rocks, other times we’re surrounded by 50 foot tall cacti and huge boulders. Up and down, twists and turns. The highway here is extremely narrow with zero shoulder and steep drop offs on both sides. There is no time to be thinking about anything except keeping it on the road. We’re sailing along 30 miles from the last gas stop, when 'BAM'. The bike just dies. No precursor, no indication anything was wrong. The bike just quits. I tried popping the clutch. Nothing. Luckily we coast to a tiny pull off on the side of the road. This is the same thing that happened outside of Yuma a week ago. We dismount. Heidi and I look at each other with intense troubled emotions in our eyes. What the hell is going on here. We wait a few minutes and try the starter. The bike fires right up. We waste no time getting back on the bike and continue on. My mind is racing with elation, confusion and concern seemingly all at once. Scenarios are being played out in my head one after another ‘we could have been stuck here’ ‘we could have been stuck there’. 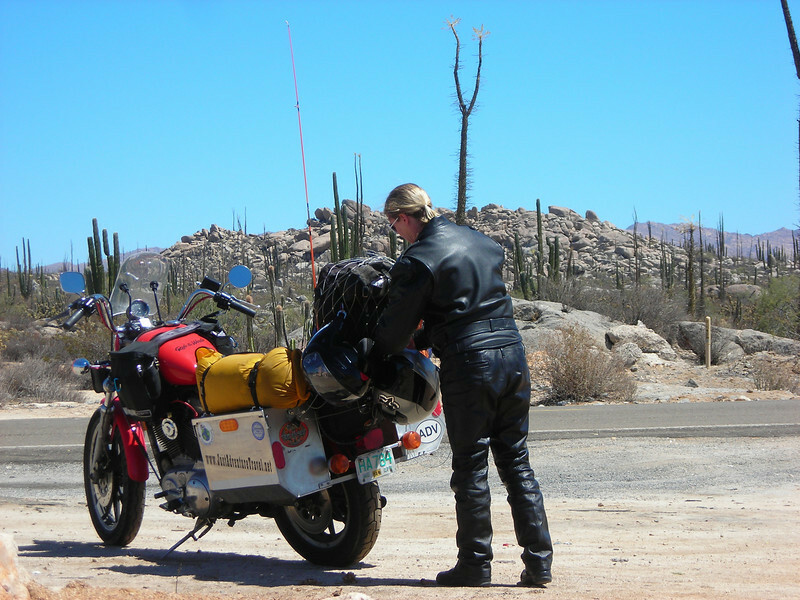 This is only our second day in Mexico and we are having big problems with our motorcycle. The road didn’t get any wider or straighter and I had little time to concentrate fully on a new plan. We just ‘ride on’.